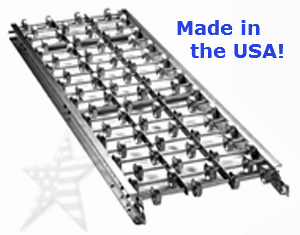 Our GRAVITY CONVEYORS are made of aluminum or 12 gauge galvanized steel frames. These SKATEWHEEL CONVEYORS are made for durability and are a lighter weight than roller conveyor making it ideal for flexible set ups for moving product. We include quick connecting zinc-plated hook and rod couplers. 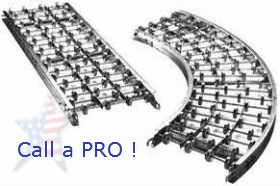 Aluminum conveyors are lighter in weight for easier handling and our Galvanized steel conveyors are heavier and more durable. Lengths are 5 ft. and 10 ft.. Widths are 12 in., 18 in. and 24 in.. Axle centers are 3 in.. Conveyor sections are 90 Degree Curve and Straight.